We are proud to introduce to New Zealand a multi-talented and distinguished international speaker from Bangalore, the Silicon Valley of India. 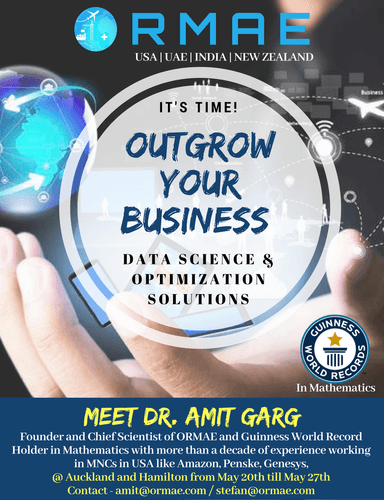 Dr. Amit Garg is a Guinness world record holder in mathematics as well as the CEO & founder of ORMAE - Operations Research, Machine Learning and Analytics Experts. ORMAE is fast growing and has now subsidiaries in the US, India, Middle East, and New Zealand. Dr. Amit has a PhD in Operations Research with 10 years of experience working as a scientist in the US and helping Fortune 500 companies like Amazon to multi-million dollar savings. This is a unique opportunity to hear from a leader in his field how Operations Research, technology and a team of very smart people take on complex business challenges to drive efficiencies and substantial savings for their clients. - Be inspired and entertained by a showcase of Dr Amit’s mathematical abilities. - Hear about how he helped his clients save in millions which added value to the overall business. - Get up close and connect over drinks and canapes during the networking part of the evening. Every organisation has data, but few are using it well to drive optimisation of resources, reduce waste, and make well informed decisions. ORMAE has worked across the following industries to do exactly that: Transport & Logistics, Supply Chain, Tourism & Hospitality, E-Commerce, Banking & Insurance, Call Center & Telecom, Healthcare & Pharmaceutical. ORMAE has also developed a two day industry specific training course on Optimisation for specialists and technologists as well as a webinar-based training module on Optimisation for students. Speaker Profile Dr. Amit Garg, Founder & Chief Scientist, ORMAE. Accomplished engineer with B.Tech in Mechanical Engineering and MS in Industrial Engineering from premiere Indian institute IIT Delhi, India with Ph.D. in Operations Research from Case Western Reserve University, USA. More than 9 years of industry experience as Senior Scientist in USA at Amazon, Genesys, Progressive Insurance, Penske and 5 years of Research and Training experience. Guinness world record holder in Mathematics, represented India in many international mental calculation championships. Industry Domain: Transportation (Trucking, Shipping, Aviation), e-Commerce, Automotive, Supply Chain, Call Center and Telecom, Banking and Insurance, HealthCare and Pharmaceutical, Tourism and Hospitality. Areas of Expertise: Logistics Planning, Location Planning, Inventory Planning, Workforce Planning & Scheduling, Network Optimization, Machinery/Equipment Optimization, Demand Forecasting, Pricing Optimization. Operations Research & Advanced Analytics Expertise: Mathematical Modelling (NLP, LP, MIP), Constraint Programming, Branch and Bound Algorithm, Heuristic Algorithms, Meta-Heuristics, Forecasting Techniques, Data Science. Presented, authored and reviewed research papers; holds patent and company trade secret in his research works. Worked on 15+ complex Optimisation & Analytics projects in Supply Chain Logistics, E-Commerce, Transportation, Call Centre and Healthcare Industry. Offered 20+ trainings, presentations, webinars on algorithms & their business impacts, applied industrial projects for business leaders and employees at their client sites. Presented in conferences with 300+ Attendees from 15+ countries from Americas, Europe, Oceania, Asia, Middle East.